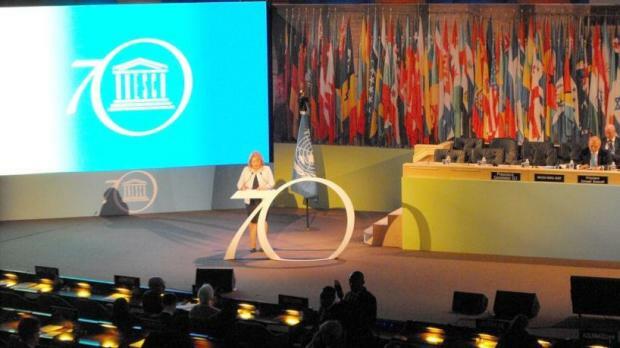 World leaders should focus on food security, gender inequality, access to education and threats to sustainability, President Marie Coleiro Preca said today when addressing the Leaders’ Forum at the 38th Session of the Unesco general conference. The forum is being held in Paris as part of the 70th anniversary of the adoption of the organisation's constitution. President Coleiro Preca said: “Together we must promote equality and justice for all. Together we must find ways of facilitating and brokering peace. Together we must strive for the wellbeing of our world,” she said. President Coleiro Preca said there had to be a renewed commitment to safeguard human dignity and rights, “not for the privileged few but for each and every one of us, wherever we live and whatever our circumstances”. Unesco’s role was critical and a ‘guide and a companion’ in this journey. The President also called for change in the approach of how economic improvement was measured, adding that world leaders had to be more comprehensive in their policy formulation. President Coleiro Preca said economic indicators and policies could not be determined just by economic factors. Other factors which needed to be taken into consideration were the indicators of well-being within communities as these were determinants of equal importance. The President also made a heartfelt plea in favour of the achievement of gender equality, one of Unesco’s global priorities. She mentioned the He4She campaign, spearheaded internationally by UN Women, with her involvement as one of 10 state leaders throughout the globe. This initiative is being promoted in Malta through the President’s Foundation for the Wellbeing of Society, to which the President has added a focus on the protection and empowerment of gender minorities. President Coleiro Preca also spoke on the Institute for Peace and Wellbeing, currently being finalised by the President’s Foundation for the Wellbeing of Society. The institute is intended to bring together a number of international academic and professional partners to research, motivate and inspire cultures of peace and wellbeing, explore best practices and find the most efficient and effective systems of knowledge sharing. “Through this institute we shall engage with communities, with a special focus on the Mediterranean region. We want to learn about how communities can achieve wellbeing, as active citizens who can effectively access and enjoy their rights. We want to promote inclusive spaces within societies as a direct pathway to peace and wellbeing”. The President called on those present to do everything within their power to eradicate poverty, diffuse conflict and ensure the equality of all members of the human family.